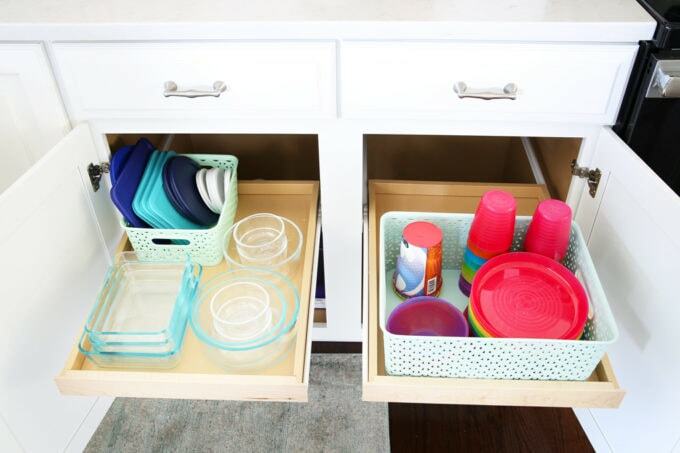 This organized kitchen tour is packed full of ideas to help declutter your kitchen cabinets, drawers, pantry, and refrigerator and keep them neat and tidy! I’ve kind of been on a kitchen organization kick lately. 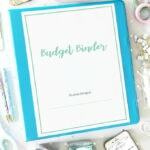 It’s one of the areas of our home that is used most often, so I wanted to make sure it was organized as well as possible to meet our family’s needs. I have been setting up little systems within the kitchen here and there since we moved in about a year ago, but I recently went through and rethought every cabinet and drawer and moved things around to really try to make the most of our space! You can take our organized kitchen tour in this week’s video! I do feel like I should make a few caveats about our kitchen. First, I am not a phenomenal cook, so I don’t have a ton of gadgets and extra cooking items that I store in our kitchen. Second, we moved from a townhouse with a really small kitchen, so I only kept the essentials there and I haven’t really accumulated many more items since we moved. This kitchen has way more cabinet storage than the last one, so that’s why we have some empty shelves and drawers available. I’m always fine with having extra space! Finally, everyone’s kitchen needs and setup will be different. I don’t know that I have anything in the exact same space as our last kitchen, and that is with mostly the same items! 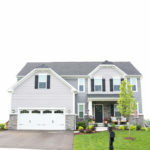 You definitely have to do what works for your family’s habits and routines and your particular kitchen layout. 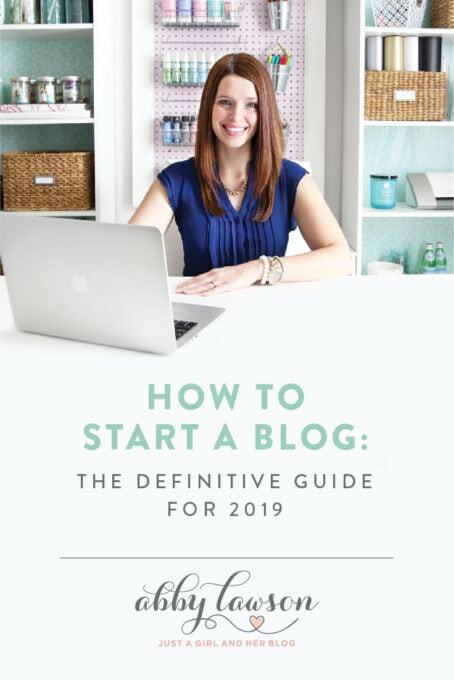 **I will share a source list with as many of our kitchen items as possible at the end of the post. Since the island is where I do most of the prep work when I’m cooking, I wanted to make sure I had my mixing bowls and bakeware close by. 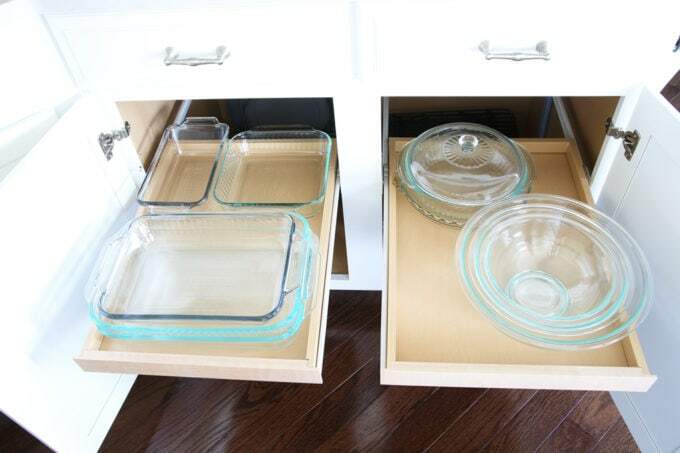 These two larger cabinets in the island fit everything perfectly, with the clear glass bakeware and bowls on the top shelves and the other items, including cooling racks, on the bottom. Our house came with these slide out shelves built into the bottom cabinets, and I love them because they make everything so easy to access! 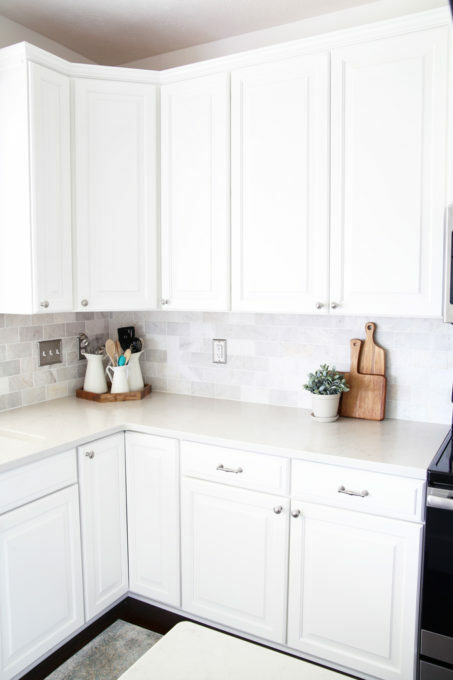 Above these cabinets are drawers to hold some miscellaneous items– candles and lighters for birthdays, an electric knife and rolling pin, also used for meal prep, and some chargers. I didn’t really feel like I had a ton of items to put in drawers, so we had some space left over in several of them. In fact, on the other half of the island, I actually had a drawer that stayed completely empty! 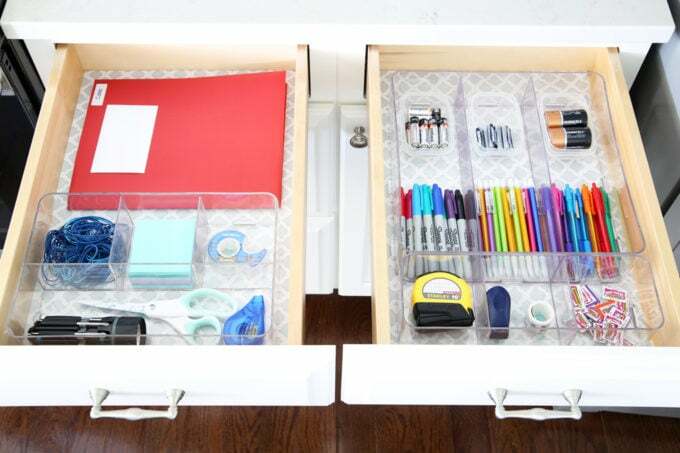 I did add a pretty contact paper liner to all of the drawers, though, so that they would be easier to clean and also to give them an extra pop of pattern. The final drawer in the island holds all of our sharp items. I moved from a countertop knife block to these bamboo knife organizers at our last house and I love that they keep the knives tucked out of the way! I also put in a simple drawer organizer to hold our apple slicing tool and bottle opener. Under those drawers I have two cabinets with more slide out shelves. One of the shelves holds all of our boxed items like ziplock bags, foil, plastic wrap, wax paper, etc. The drawers in the island are actually fairly shallow and I was having trouble getting the boxes to fit neatly in a drawer, so putting them on a slide out shelf ended up being the perfect solution for us. I also keep our pots and pans on this side of the island, which is right next to the stove. 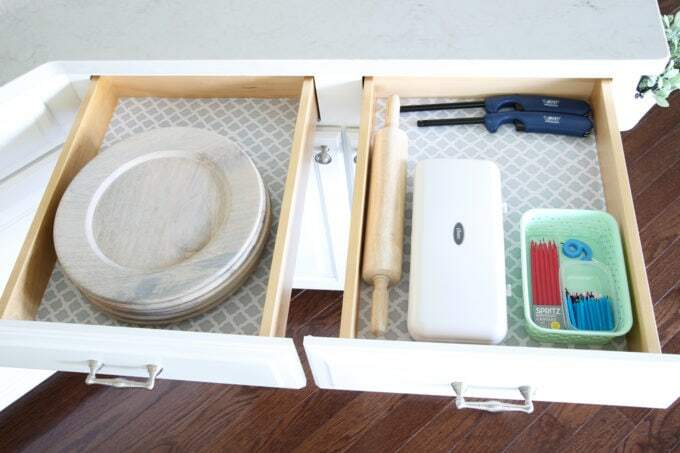 I don’t use any fancy organizers to keep them neat; I simply nest them inside one another and place the lids on top, and it has worked really well to keep this cabinet in shape! 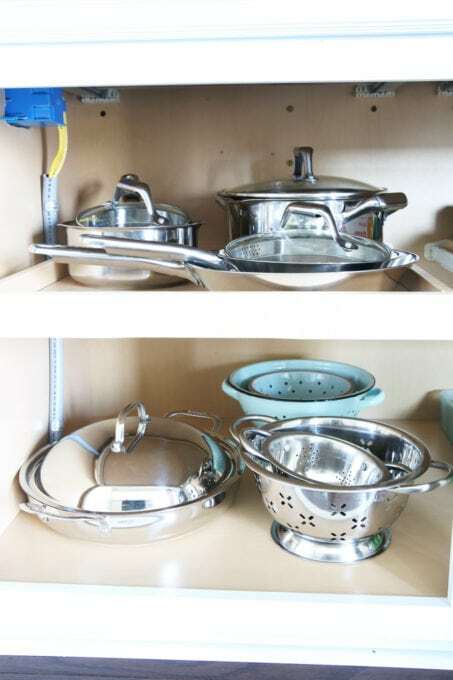 And we also have our under-the-sink area organized, which I showed in this video a few weeks ago. 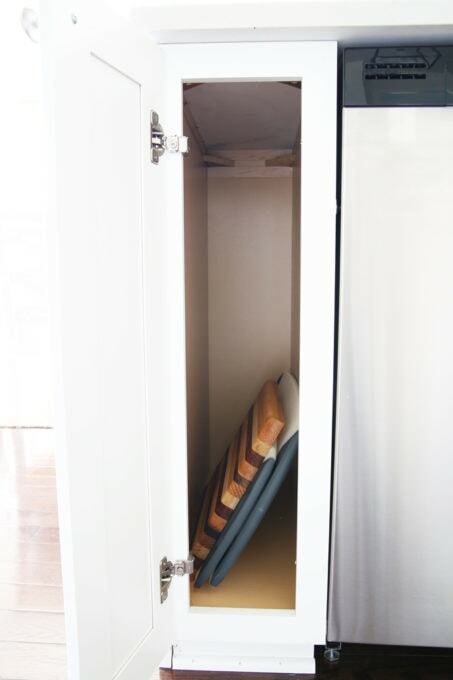 In the back corner of the kitchen, we have quite a few cabinets for storage, which is great, but the shape and size of some of them can definitely be challenging sometimes. 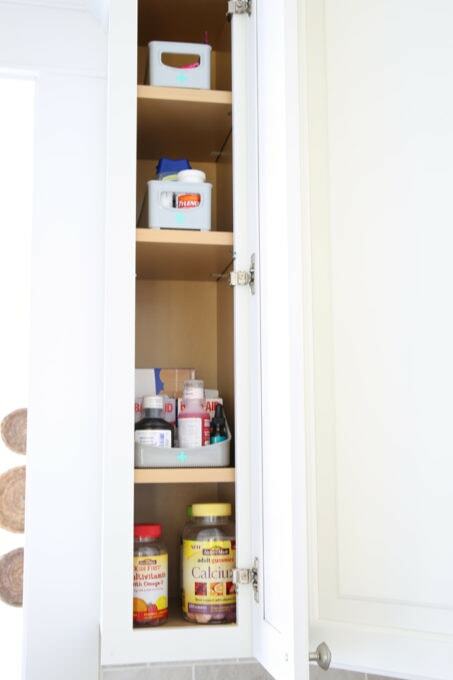 It took me a bit to figure out what to put in the very narrow upper cabinet by the sink, but it ended up working perfectly as a medicine cabinet of sorts. I keep all of our daily vitamins on the bottom shelf, and then I used some simple gray organizers that I found at HomeGoods to organize the rest of our meds. I cut out a little medical cross with my Silhouette machine + adhesive vinyl as an extra little touch! The kids’ meds (read: mostly band aids that they insist they need about 10 times per day 😉 ) are in the lowest organizer, and then adult meds are higher up. 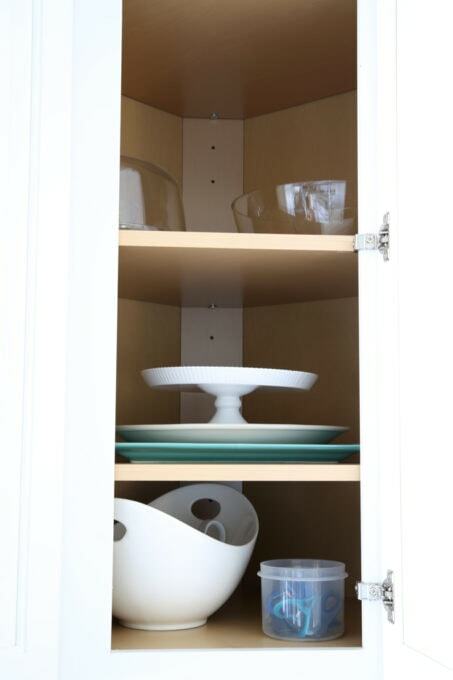 The corner cabinet can be another challenging space to organize in the kitchen. 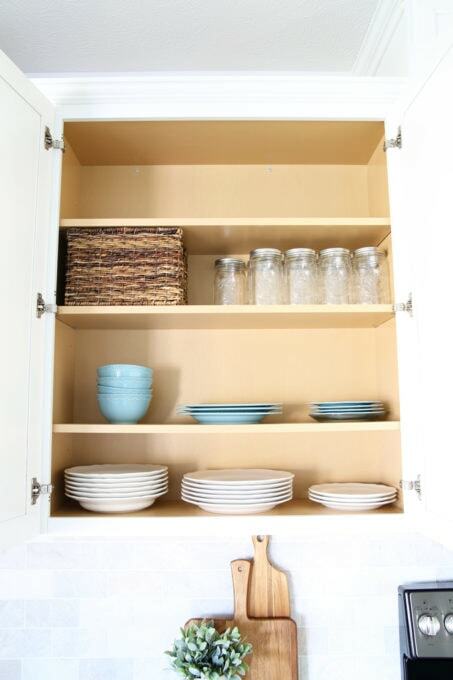 In our last house I had our everyday dishes in this cabinet (mostly because that’s the only place they would fit! ), but in this house I’m using it to hold our serving pieces, and that has been working out well so far. You can also see our little container of chip clips that I keep handy so we can easily access them when we’re cleaning up from lunch or dinner. Right beside the corner cabinet I keep all of the items for a little “smoothie station.” I have a smoothie or shake nearly every day, so this cabinet is used often! 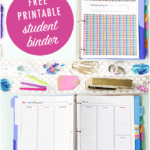 I simply have them organized by color! Up above I keep some mason jars that I’ll sometimes use for food storage or to hold a bouquet of flowers. I also have a basket that keeps our lesser used kitchen gadgets, things we still need to keep on hand but that we don’t access often. We keep all of our paper products in this cabinet, which are mostly used for the kids’ birthday parties or if they’re having a lot of friends over. 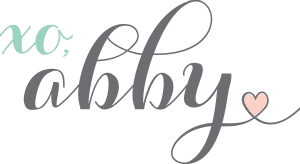 I’ve done separate posts about how we organize our food storage containers and our kids’ dishes. If you have a really good eye, you’ll noticed that I moved the kids’ dishes from a spot in the island over closer to our everyday dishes. We’re still using the same system, just in a different cabinet. Down below the sliding shelves I have a few more mint bins (which I LOVE), one of which holds all of Donnie’s supplements, and the other of which holds the boys’ lunch boxes for school. 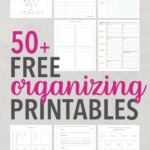 I used pretty much the same organization system for these in our old house and it worked really well, so why mess with a good thing?! 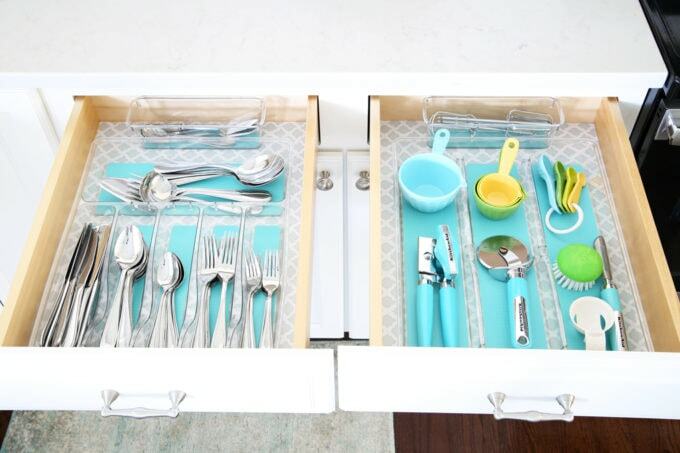 I again used the pretty drawer liner, and love these drawer organizers with a pop of aqua at the bottom. 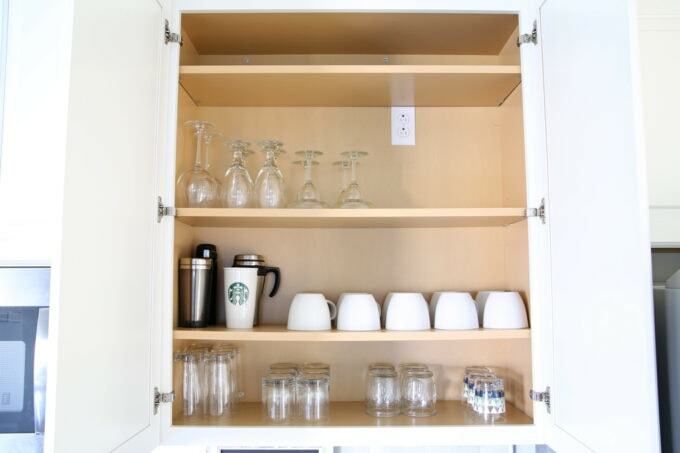 We have one final set of cabinets between our range and our refrigerator– I call this area our coffee station, though it really holds more than just coffee supplies! I admit, I recently couldn’t take it any longer and traded out all of our mismatched mugs for these really inexpensive plain white ones! Donnie really likes larger mugs for his coffee, so these ones held more than most of our older ones anyway. 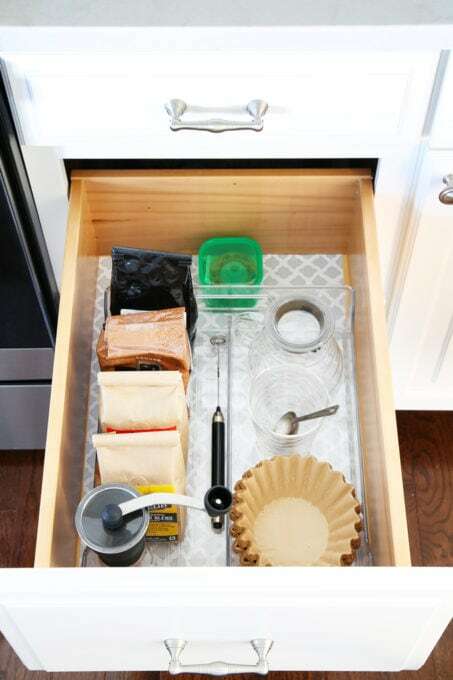 Below the left drawer is Donnie’s coffee drawer. 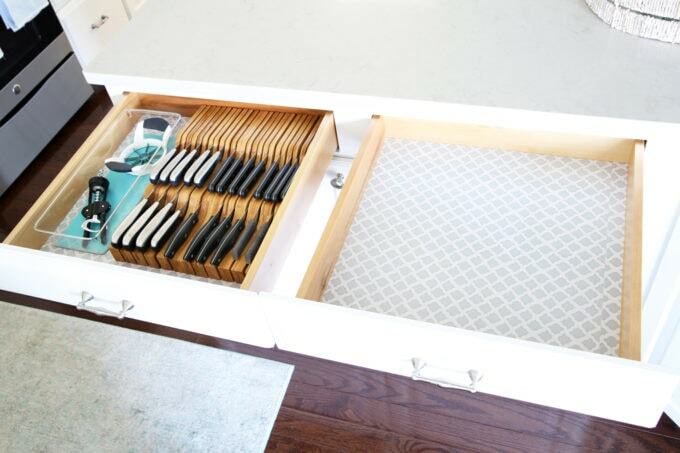 I used this clear tray to keep everything in organized rows. Along with the Keurig, he also has a traditional coffee pot that he’ll get out occasionally, so those supplies are in this drawer. 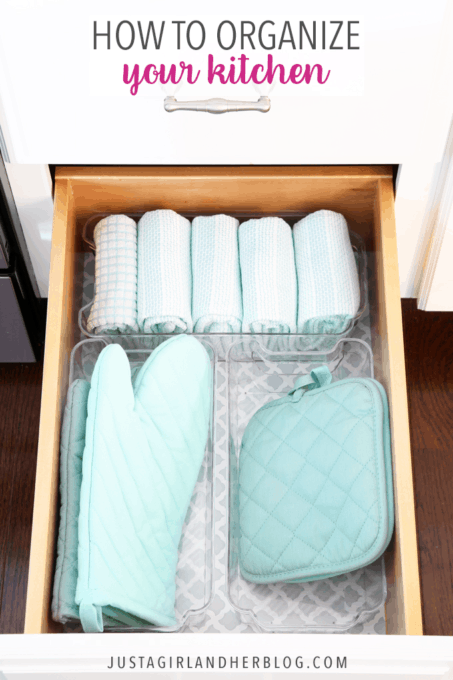 The bottom drawer in this row is devoted to dish towels and pot holders. The clear organizers I used to keep everything separated are from HomeGoods, and I loved that the 3 of them fit perfectly in this space!! 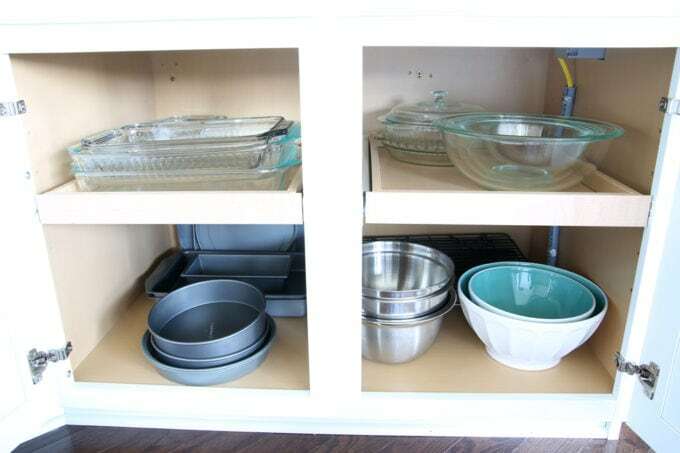 The final cabinet holds our cookie sheets and muffin tin. You can see that this cabinet used to have a slide out shelf as well; I removed it to have more room for the cookie sheets. 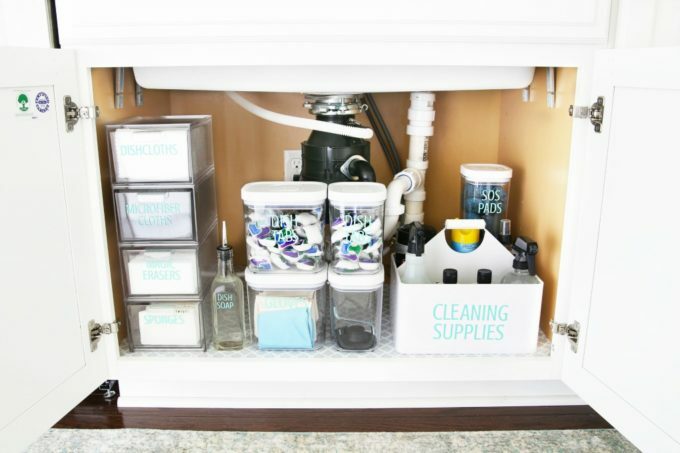 I just use a really simple organizer that I found at Bed, Bath, and Beyond to keep this cabinet organized, and it works like a charm! That about does it for the cabinets! 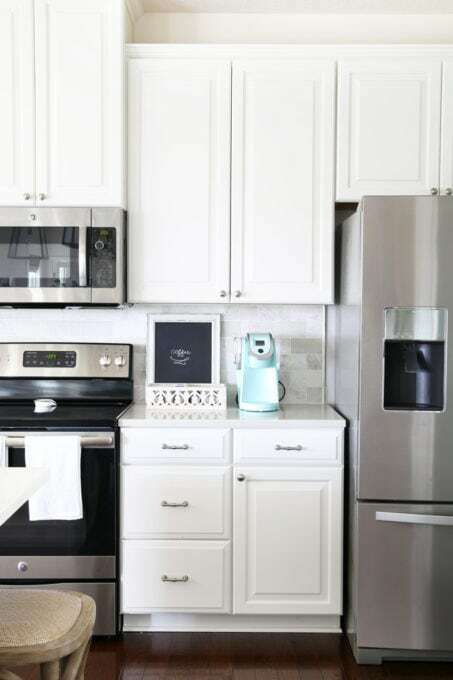 I did separate videos on each of those areas, so I won’t go into detail about them again, but you can get the details about our organized refrigerator here and our organized pantry here. Whew! That was a lot of info! Hopefully this gives you a better idea of how our kitchen is set up and maybe gives you some ideas for organizing your own kitchen as well! 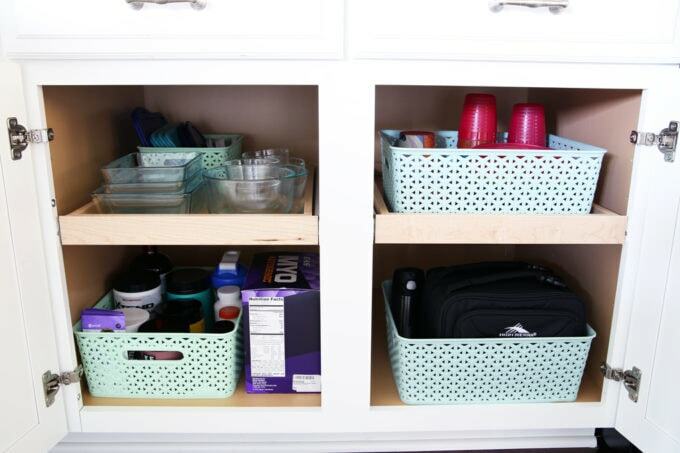 Do you have any awesome kitchen organization tips to share? I’d love to hear them in the comments below! 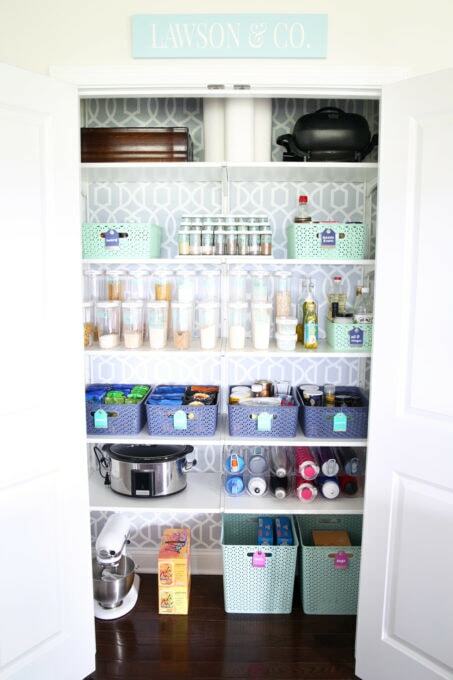 I really like how you organized your kitchen! 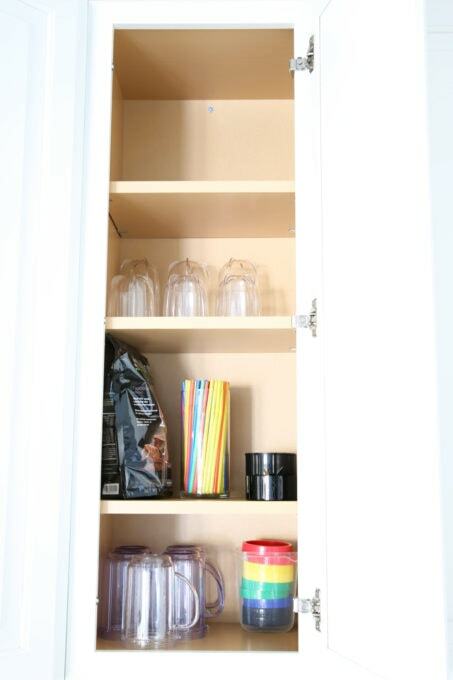 Since I don’t live near a Home Goods, would you be able to find out the brand of the containers for the inside of your narrow cabinet? 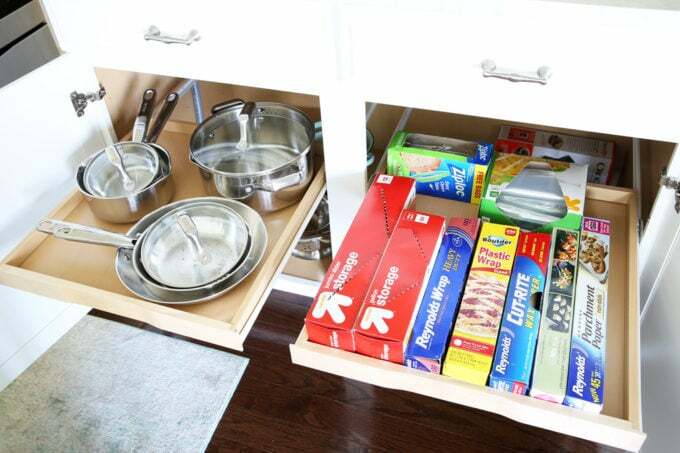 I have a narrow cabinet like that and those would be perfect! Hi, Kimberly! I just went and looked at them and couldn’t see any brand markings on them anywhere– I’m so sorry about that! 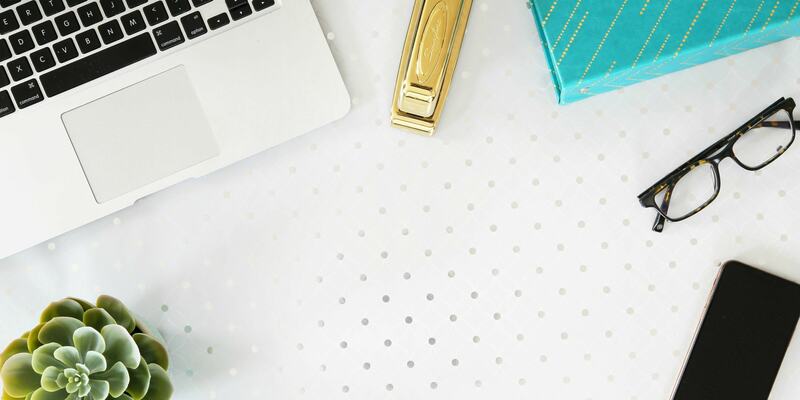 Some brands that I think I’ve gotten at HomeGoods before are InterDesign, mDesign, and iDesign, and I’m pretty sure they sell items on Amazon too, so it may be worth looking there. Hope you’re having a great week! Oh, I would just love a butler’s pantry! They are so awesome. Thanks so much, Jolene! Hope you’re having a wonderful week! I love your kitchen Lighting! Do you mind telling me where they’re from ? Hi, Emmy! The pendant lights are Ren Wil Bohr 1-light Black Pendant lights that we got on Overstock.com. 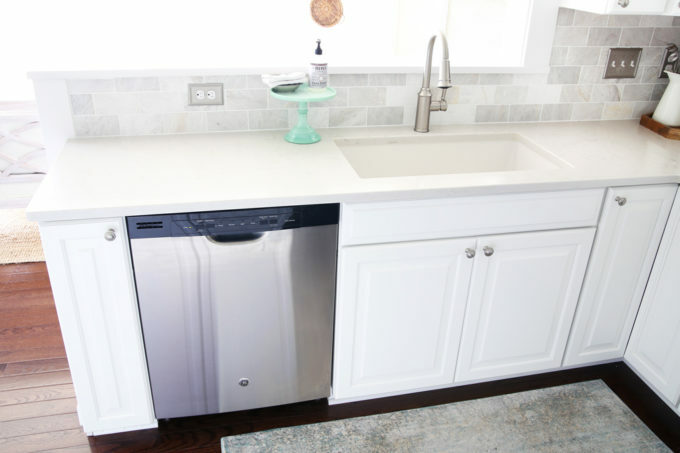 They’re linked here: https://justagirlandherblog.com/white-kitchen-reveal/. Thanks so much and have a wonderful day! 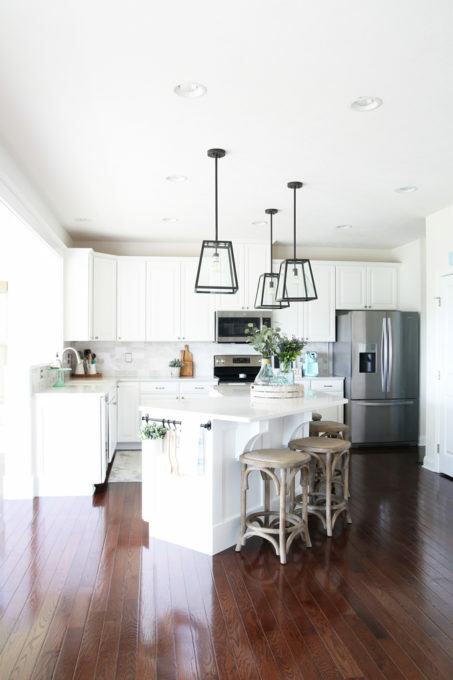 I’m always impressed with your organization posts, especially of your kitchen, because I don’t think mine have every looked so magazine gorgeous. 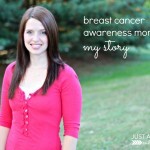 I’m inspired by them and think that maybe, when the kiddos are out of the house, mine may be just as beautiful! Thanks for the tour of your kitchen to give inspiration and ideas! How did you make your island so beautiful!? 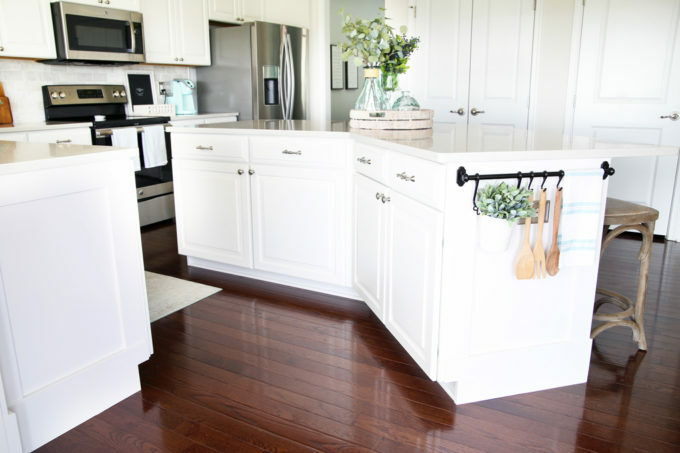 We have the same floor plan, cabinet color and island. I wanted to get the newer island being released but they would not change it during our build. Even though our home hadn’t even started! I was thinking bead board on the back, but that looks so much more elegant! Hi, Savanna! 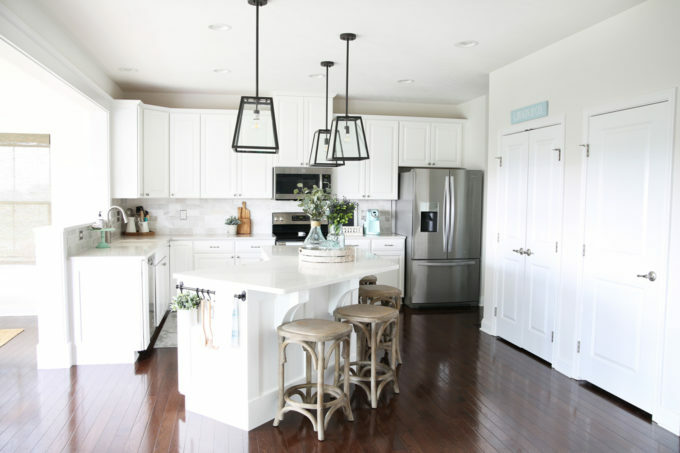 We wrote all about how we added custom trim in this post: https://justagirlandherblog.com/how-to-add-custom-trim-to-a-kitchen-island/. It really does make such a huge difference! Hope this helps. Have a wonderful day! Thanks so much, Carolyn! Acrylic bins really are the best! 🙂 Happy Monday! Hi Abby! The difficulty with my kitchen (built in the architectural black hole of the early 80’s) is that it’s huge, but the working space is itty bitty. I have added a huge second “pantry” with industrial stainless metal shelving, which has helped and I am so inspired by your videos to make what space I do have look gorgeous and not utilitarian. 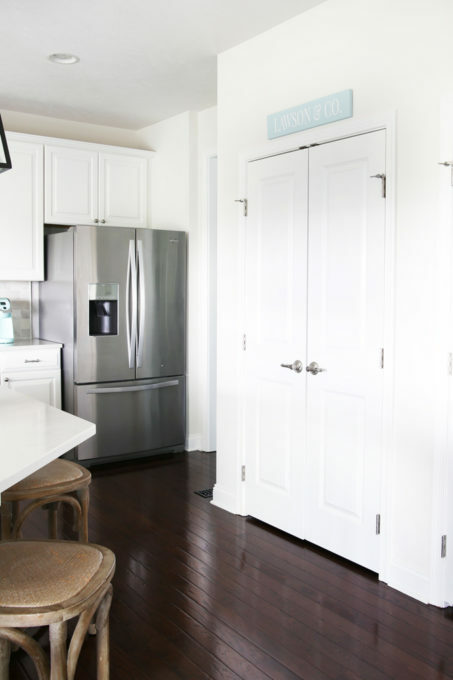 My kitchen is done in blacks and grays, but thanks to your video, I’ve been inspired to add punches of my favorite color–sky blue! Thanks Abby!! Hi, Isabel! 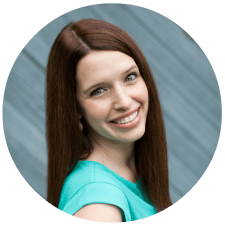 I’m so glad that Framework has been helpful– thank you so much for your sweet words! As far as the mugs go, I pitched any that were chipped. I have a few that I use mostly just for decorating our hutch and trays, so I put those ones with my decor. My mom snagged a few of them that she thought were cute. And I keep a donate box in our basement that I am consistently filling up, dropping off, then starting a new box. So really a little bit of everything! 🙂 I hope this helps! Have a great day! Your kitchen looks GREAT! Here’s a question: I recently bought some nice, higher-end cake pans and realized (to my horror) that they don’t stack because of their perfectly vertical sides. They’re 3 inches tall and I have 3 of them. They’re great pans, but they are a storage nightmare. Do you have any suggestions? I’ve thought about using them as “bins” for other items, but that would be a big hassle when I want to use them. Right now they’re just taking up a huge amount of shelf space in my pantry. Any thoughts from an expert would be appreciated! Thanks, Abby! Hi, Melanie! 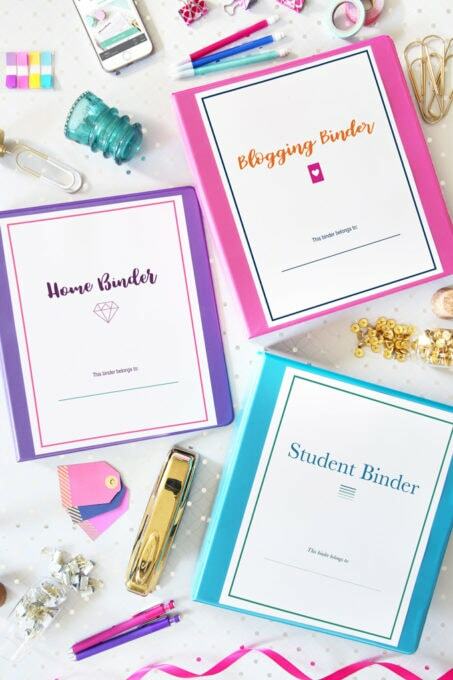 My first thought was something like this: https://www.target.com/p/lipper-international-bamboo-three-tier-corner-shelf/-/A-13578924#lnk=newtab , which would allow you to “stack” them without actually setting them on top of one another? 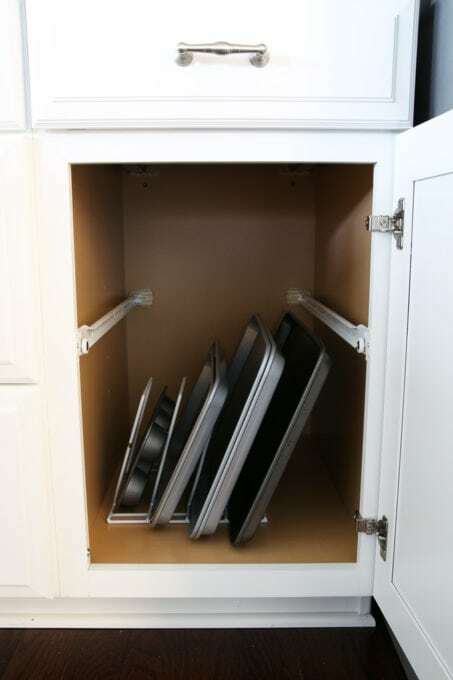 If that doesn’t work, you could “file” them on their sides with a baking pan organizer if you can find one that’s wide enough or with tension rods, similar to this: https://www.pinterest.com/pin/Adke-9BIq_UwgNh5rdlQaWZKwoqzgwekjz1regzfJkQxkm5AQkSSq-U/ . I hope this helps! Have a great day! Thanks so much, Sean! I appreciate it! Have a great week! I noticed you didn’t show anything in the cupboards above the microwave and fridge. What do you store there? Good spot, Kristina! 🙂 There is actually a big venting tube type thing in the cabinet above the microwave, so there’s not much actual storage space in there. The cabinet above the fridge has a few random things that we don’t use often like seasonal cookie cutters and a drink dispenser that I only use a few times a year. Nothing too exciting! Hope you’re having a great week! Would love to know where you got the towel bar, holders and pot with greenery for the end of your island. I would love to do that in my kitchen remodel. Thanks for sharing!!!! Hi, Sherry! Those are all from the FINTORP series at IKEA: http://www.ikea.com/us/en/catalog/categories/series/21592/ . I like them too! Best of luck with your remodel! 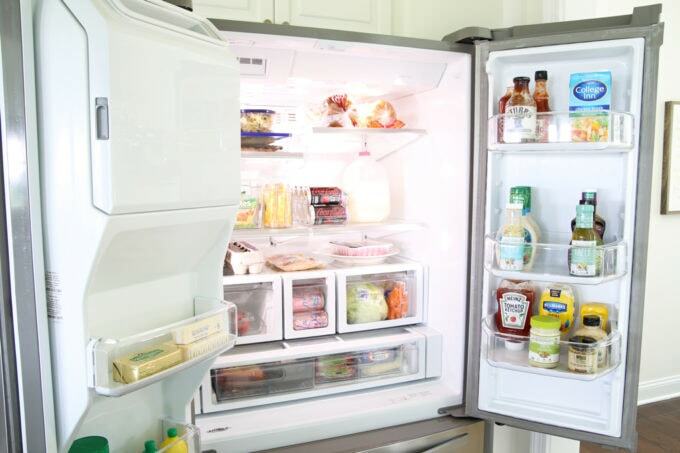 Your kitchen is so organized. 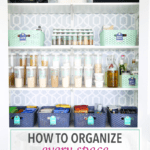 We are getting ready to redo our kitchen cabinets and once I have that finished I am going to re-organize our entire kitchen an pantry. This is great inspiration for me! Thanks! 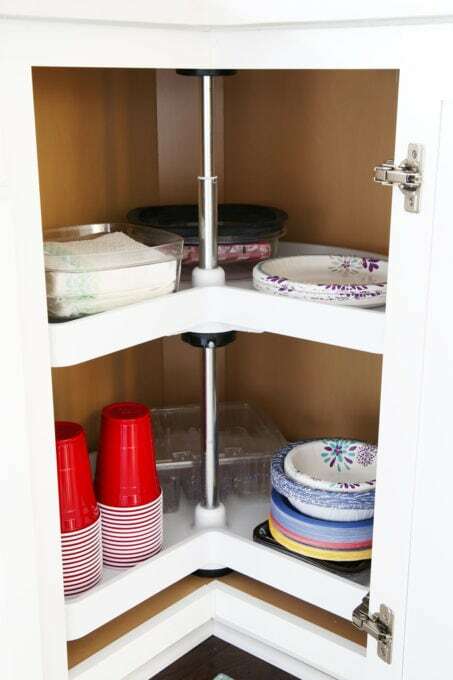 Where do you keep your cooking utensils like spatulas, wooden spoons, spaghetti fork, etc.?? 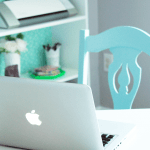 Your kitchen is beautiful!! Hi, Melodie! They are in the back corner of the kitchen in the white pitchers sitting on the hexagon tray. Thank you so much for your sweet words! Have a great week!